Soup is one of my favorite dishes to make in advance. It freezes really well, and it’s a total breeze to prepare on cooking day, as it usually just involves dumping the entire contents of the bag into a pot and letting it simmer. This particular recipe is a family favorite. Along with plenty of protein and fiber, it has all of the great flavors kids love in tacos but with fewer ingredients. So it tastes like a recipe that you spent a long time preparing, when in reality it comes together in no time. When I’m preparing my freezer meals, I like to pick recipes with common ingredients to make them more cost effective. If you prepare this meal and our steak fajitas on the same day, you can freeze the toppings for both, cutting down on waste. In a skillet over medium heat, cook the ground beef with the onion, garlic, salt, and pepper. Drain off grease. Add cooked beef mixture to a gallon-size plastic freezer bag. Add taco seasoning, beef broth, tomatoes, beans, and corn to the bag. Place any optional toppings (sour cream, cheese, green onions) each in a separate sandwich-size freezer bag. Bundle all bags together in one large plastic bag. Label with meal name and date. Freeze until ready to use. 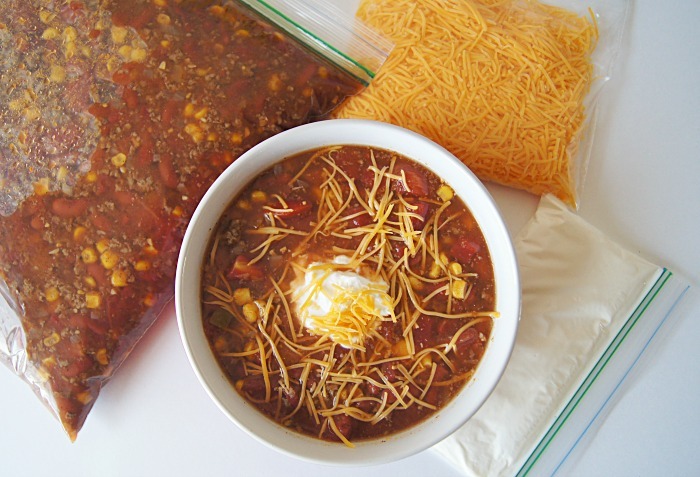 When ready to serve the soup, thaw bag(s) in the refrigerator, preferably overnight. Pour contents of beef mixture bag into a large pot and simmer for 20 to 25 minutes. Serve in one-cup portions and add optional toppings, if desired.